“In 1967, following the death of manager Brian Epstein, the Beatles founded Apple Corps as an umbrella company for all of their creative endeavors, with sub-divisions that included Apple Retail, Apple Publishing and Apple Electronics. A year later, as the Beatles returned from their famous trip to India, the band founded Apple Records in London in 1968. With a forward-thinking, artist-oriented philosophy, the label was designed to foster talent in a creative, nurturing environment, and provide an alternative to the traditional record companies that had dominated the British music industry since before World War II. “…While never run on a wholly commercial basis, Apple Records was nevertheless a functioning and successful record label in its early years. Between 1968 and 1973, Apple issued around 50 singles and over a dozen albums by artists who weren’t known on a first name basis as John, Paul, George or Ringo. It’s an electric, eclectic collection, spanning musical genres and drawing upon influences from around the world. Especially in the beginning, most of the label’s signee’s were acts the Beatles personally discovered or supported, and in most cases one or more of the Beatles would be involved in the recording sessions. Artists including James Taylor, Mary Hopkin, Billy Preston, the Modern Jazz Quartet, the Iveys (later known as Badfinger), Doris Troy and Jackie Lomax were all signed to Apple within the first year”. I find a lot of inspiration and guidance thinking about what The Beatles wanted to do with Apple Records. They wanted to create a safer space where artists could release the music they wanted; there was no leaning and pressure from big labels and it was especially beneficial for The Beatles. I find, fifty years after the record label started life; how many artists have been inspired. Big musicians around the world, Kate Bush included, have set up their own labels and have decided to do things their own way. There are a lot of big artists who, one feels, are being guided and controlled by the labels who represent them. I am not suggesting there should be a huge mutiny but it would be good to see more mainstream artists setting up their own labels and breaking away from the big boys. I know artists who have their own label but not recruiting or attracting that many artists – maybe I need to have a closer look. James Murphy (LCD Soundsystem) and Jack White (Third Man Records) have their own brand; Jay-Z has Roc Nation, Chvrches have Goodbye Records. It is great to see artists show some autonomy or, at the very least, provide a unique and reliable space for artists. These musicians provide options for musicians who either cannot get signed by big labels or want some freedom in their work. The Beatles’ last big record before 1968, Sgt. Pepper’s Lonely Hearts Club Band, was released through Parlophone in the U.K. The Beatles was the first album released through Apple and, although the band were cracking and straining, I wonder whether Parlophone would have released a double-disc/four-vinyl album that was so scattershot and eclectic. Each band member was on a different page; songs were recorded in different studios and there were few tracks (of the thirty) that contained every band member. The unhappiness in the ranks did not translate into poor material: The Beatles is seen as one of their finest and a hugely ambitious work. 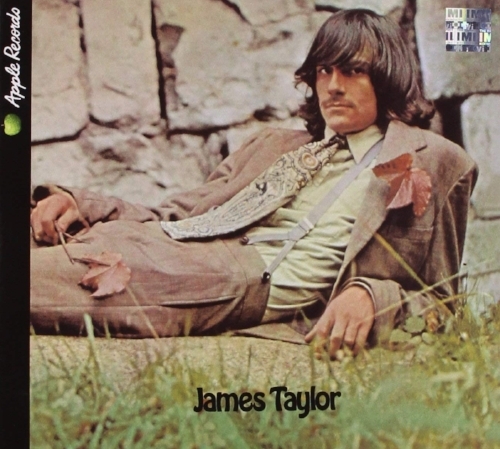 “James Taylor’s self titled debut was the first recording by a non-British artist released on Apple Records. It was produced by Apple A&R head Peter Asher during the time Beatles were recording The White Album. After being shown the demos by Asher, Paul McCartney recalled, “I just heard his voice and his guitar and I thought he was great … and he came and played live, so it was just like, ‘Wow, he’s great.”. “Controversy also dogged the Scottish band White Trash, who issued two singles on Apple. While political correctness could be happily dispensed with if within the realm of TV satire, when it came to rock music, even a suggestion of reverse racism was stamped out by the cultural custodians of the day. Hence the truncated name, Trash, for the band’s second Apple 45, a storming cover of their paymasters’ ‘Golden Slumbers’/’Carry That Weight’. The late Errol Brown, the much-loved voice of Seventies disco kings Hot Chocolate, was first heard on record thanks to Apple. In 1969, the group gave John Lennon’s ‘Give Peace A Chance’ a reggae make-over, and when they sent their recording to Apple for approval, Lennon loved it and instructed the label to release it forthwith. Intriguingly, the record goes beyond a note-for-note rendition of John’s Plastic Ono Band anthem — check out the changes in the lyrics for a true Apple original. “…Bill Elliot & the Elastic Oz Band’s ‘God Save Us’ is a Plastic Ono Band single in all but name. The song was John Lennon’s fundraiser for the underground magazine Oz. In 1971, the editors stood in the dock, charged with that old chestnut, obscenity. Among the crimes committed in their ‘Schoolkids’ issue of May 1970 was a pornographic cartoon featuring a sexually aroused version of ‘Rupert the Bear’, whose ursine unimpeachability had been scurrilously corrupted into a Robert Crumb character from the waist down, in flagrante delicto with all his naughty parts clearly displayed. The editors ended up in prison, briefly, but their convictions were overturned upon appeal”. “From the beginning, The Beatles' members used Apple to put out records by other artists they liked, as Lennon and Paul McCartney explained in a 1968 television interview. Apple put out three other singles on the same day it released "Hey Jude," including "Those Were the Days" by Welsh singer Mary Hopkin. That song also topped the charts”.